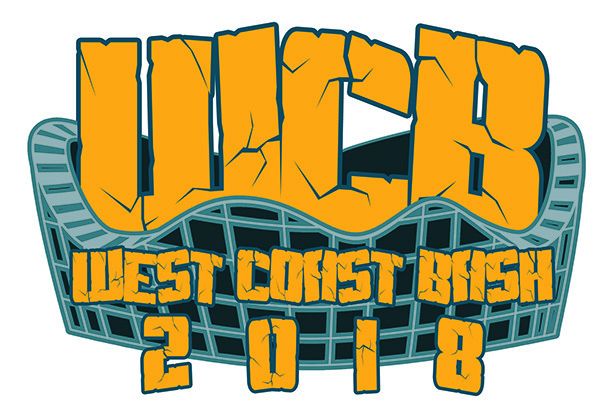 West Coast Bash 2018 - Six Flags Magic Mountain - Sunday Sept 9th - Theme Park Review Store - Roller Coaster & Theme Park Stuff! West Coast Bash is a theme park "fan event" that includes "Exclusive Ride Time" to avoid in any lines as well as many other awesome perks! - TWO Hours of Exclusive Ride Time! EVENT DETAILS AND RIDE AVAILABILITY SUBJECT TO CHANGE WITHOUT NOTICE! A final event schedule with more details will be emailed to you prior to the event. You will pick up your tickets at the event during morning check-in. If you are registering for more than one person, please complete a separate registration for each member in your party. Choose your options and click "add to cart" for the first person, and then come back to this screen again and choose your options and click "add to cart" for each additional ticket. * Six Flags Magic Mountain is open until 8pm on this night. We have been given special permission to mix in with an already scheduled private event that will take place from 8pm - 10pm to give an additional two hours of extended park time! - Cameras are not allowed on any coasters or rides at the host park. - All event participants MUST abide by ALL park rules and Theme Park Review’s/Club TPR's code of conduct and terms of service. Violation of park rules is subject to you and your guests removal from the park and your account being banned. - Q: What do I need to do to attend this event? A: Simply register online and your event packets, tickets, and other information will be available the morning of the event. Nothing will be mailed to you. You must pick up your tickets at the event. - Q: Will you have onsite event registration? A: Sorry, but no tickets will be available during morning check in. TICKETS WILL BE LIMITED so register NOW. - Q: How do I buy more than one ticket? There is no place for "Quantity" in the store? A: Click add to cart twice. - Q: I cannot make it to the park before check-in ends or I need to leave before evening ERT, can I still attend the event if I cannot make the entire day? A: Yes, you may arrive after check-in ends. Your event packet will be left at will call or guest relations under the name of the person who registered. If you need to leave before evening ERT, you may do so, but we hope you can stay because it will be amazing! Please note there are NO REFUNDS given if you cannot make the event. - Q: How old do you have to be to attend this event? A: There is no age limit for this event! - Q: When will the final event schedule be released? - Q: What does "ERT" or "Exclusive Ride Time" mean? A: ERT means that the rides and attractions listed during those times on the schedule are open ONLY to attendees of this event. - Q: Can I apply the cost of my event ticket towards a season pass? A: In the past, our host parks have allowed members to do this. I would imagine it would be the same this year, although we have not heard anything officially. - Q: What is your refund policy? A: Once you have paid for an event ticket, there are NO REFUNDS. You are welcome to try to sell your ticket to another member, but it would not be possible to refund tickets. - Q: If I am mailing in a check, when do you need the payment by? A: Checks are no longer accepted. We only accept PayPal for payments, sorry. - Q: Does this event price include admission to the park? A: If you are a season pass holder and you purchase the season passholder ticket, your season pass serves as your park admission. If you are not a season passholder, and you purchase a non-season passholder ticket you will be given a park admission ticket for the event day. - Q: Who can attend this event? A: Anyone! We encourage you to be a member of our online forum, Club TPR, or our social media pages but it is not necessary to register for West Coast Bash. - Q: Is the parking fee included? A: Expect to pay for parking on the day of the event. On occasion, a host park has not charged the parking fee for our members and should be considered a "bonus" if this happens during the event. Please note that if you are allowed to park for free in the morning, you may be required to pay for parking if you leave the park and come back later in the day. - Q: Does this event price include airfare, transportation, or hotel lodging? - Q: What if I'm an employee of the park, do I have to pay for admission? A: If you work for the park and you get admission included as part of your employment benefits, then choose the season pass price and use your employee ID to enter the park. Theme Park Review reserves the right to deny ticket sales or entry to the event to anyone. If you are someone who was previously banned from our forum or social pages you will not be allowed into the event. If your guest is someone who has been banned from our forum or social pages, they will not be allowed into the event.